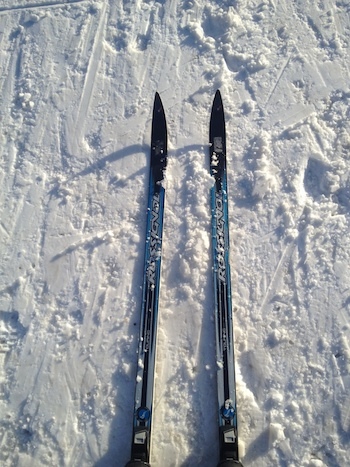 The last time I went cross-country skiing, I was a skinny, little pig-tailed girl in elementary school. We used to go during phy ed class. I vaguely remember our class heading into the dark, musty, “forbidden” basement of the school to get geared up, clunking up the stairs in our boots, then skiing across the school grounds. I loved it then, but by the time junior high rolled around, my friends were more interested in downhill skiing. Within a short time, I grew accustomed to locking my entire boot into my binding (rather than just the toe) and gathering speed down green, blue, and black diamond runs. So long, xc. You weren’t nearly as fun. Over the years, I have met people of all ages casually mention cross-country (Nordic) skiing as a hobby, and twice a year I give the sport a flash of my attention during the popular City of Lakes Loppet (happening this weekend!) and Birkebeiner ski races (Feb. 22, 2014), but that’s about it. Cross-country has always been a sport for other people, just not for me. But then my friend Jeremy rented skis and had a blast, and my friend Anna spent an afternoon cross-country skiing and had a great time, and listening to their stories sparked my curiosity. It sounded like fun. Less of the “I’m-careening-wildly-out-of-control-this-is-scary-and-exhilarating-GET-OUTTA-MY-WAY!” kind of downhill skiing fun and more of the “I’m-outdoors-appreciating-Mother-Nature-in-a-fairly-challenging-yet-way-more-relaxed” kind of fun. And bonus that it’s a great full-body workout. And there are no chairlifts! 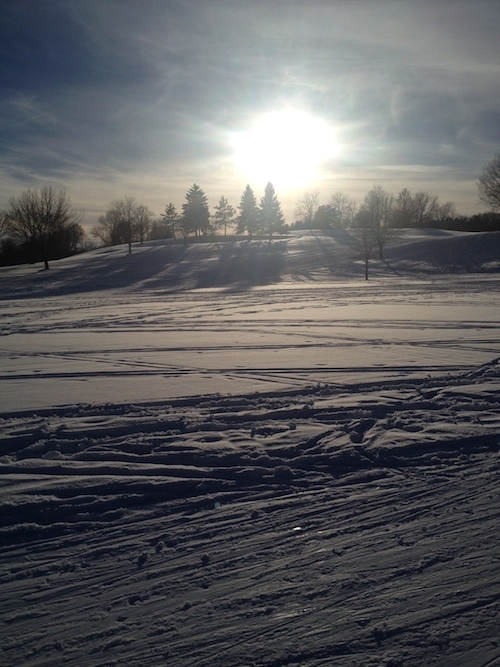 What inspired you to try cross-country skiing? I love running and biking outside in the summer and was looking for a way to embrace the outdoors in winter. Had you ever gone before? I cross-country skied a little in high school gym class, but it was just a flat trail around the school grounds. Do you know many people who cross-country ski? Yes, I have Norwegian roots and grew up in Minnesota, and I have many friends and family members who cross-country ski. There is a saying that Norwegians are “født med ski på beina” (born with skis on). Did you buy any special gear for your outing? My husband bought cross-country skiing pants from REI, but I worked with what I already had—running tights, a Columbia fleece zip-up, etc. Where did you rent your skis? Theodore Wirth Park’s Par 3 Clubhouse. Lessons are available on Saturday and Sundays. Did you have to call ahead to reserve equipment or just show up? No, just show up. If you want a lesson, you should register ahead of time. Did anyone help you with your boots and skis? It was pretty busy when we got there, so we were mainly figuring it out by ourselves, but asked some people around us about the equipment. Did anyone give you pointers? Yes, people out on the trails were very friendly—some very experienced and other total beginners. When I was starting out and someone saw me tensely coming down a small slope, trying not to get out of control, they yelled out, “Bend your knees!” That helped a lot! We went along the cross-country ski trails at Theo Wirth. Bend your knees! No matter how silly and awkward you may look while learning (and falling down), at least you’re getting some fresh air and exercise! In addition to renting at Theo Wirth, you can also rent cross-country skis at Columbia Golf Course in Minneapolis, Como Park Ski Center in St. Paul, and REI (Bloomington, Maple Grove, and Roseville locations). • Like Anna said, bend your knees! • Remember that your boot isn’t strapped onto the ski (just the toe of your boot is secure) and your skis aren’t glued to the ground like they are with downhill skis. You can step around on cross-country skis. • Resist the urge to jog or “shuffle” on cross-country skis. Lean forward, throw your arms out in front of you, pause between your strides, and glide. This will save you energy. • When you turn, transfer the weight onto your forward ski, just like on rollerskates or ice skates. If you sit back, you’ll land on the ground. • When going uphill, use the herringbone technique (this resembles how you would imitate a penguin or a waddling duck, only on skis). • Practice, practice, practice. Your technique will improve with lessons, time, and patience.